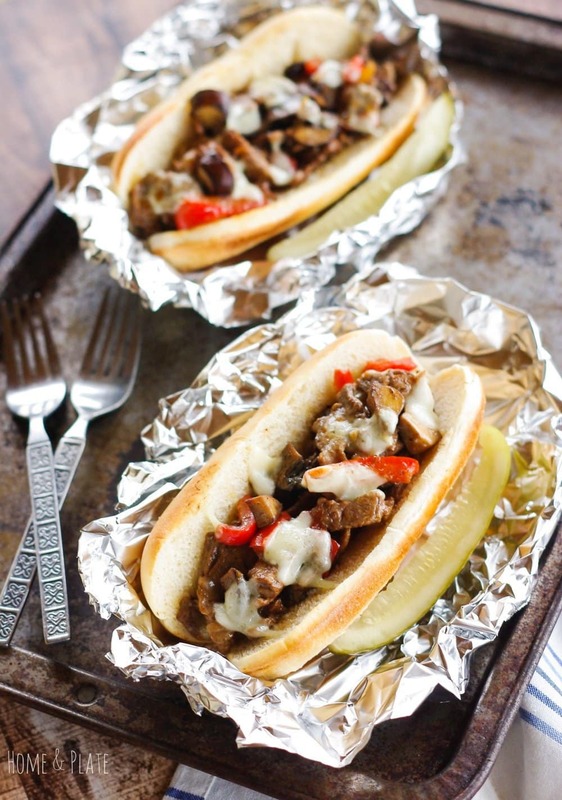 Meaty, cheesy and full of flavor, my New York Strip Steak Sandwiches are my version of classic Philly cheesesteaks. Cheesy and meaty, these are the perfect grub on game day or any day of the year. My Ohio State Buckeyes had a great football run this past season and basketball is now in full swing. We do a lot of tailgating and enjoy spending time with friends and family during game time. I have a lot of great recipes that serve up well on game day including my buffalo hashbrown chicken casserole, my guilty pleasures artichoke spinach dip and my sweet & saucy shredded chicken toppers. 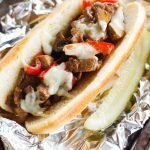 If you want a sandwich to serve up on game day these New York Strip Steak Sandwiches are the perfect option. Similar to my French dip sandwiches, these sandiwches are ideal for a hungry appetite. Instead of roast beef from the deli I use New York strip steaks shaved from the butcher. It’s simply a matter of asking them to shave the steak into thin slices that you can chop up easily when you get home. No need to freeze your steak to slice it up ahead of time. I also picked up a red bell pepper, a package of baby bella mushrooms and a sweet Vidalia onion. A quick stop down the bread aisle for steak or hoagie rolls and I’m all set. 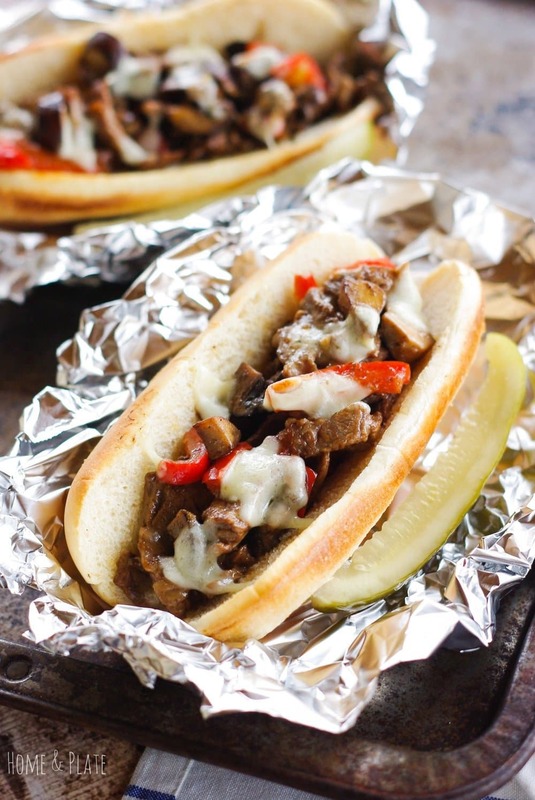 The big question when it comes to Philly cheesesteak sandwiches is what kind of cheese to put on top. There’s debate as to whether provolone or American cheese results in a better sandwich. For that answer you’ll have to ask a loyal Philadelphian. The choice is really yours but my preference is provolone cheese. 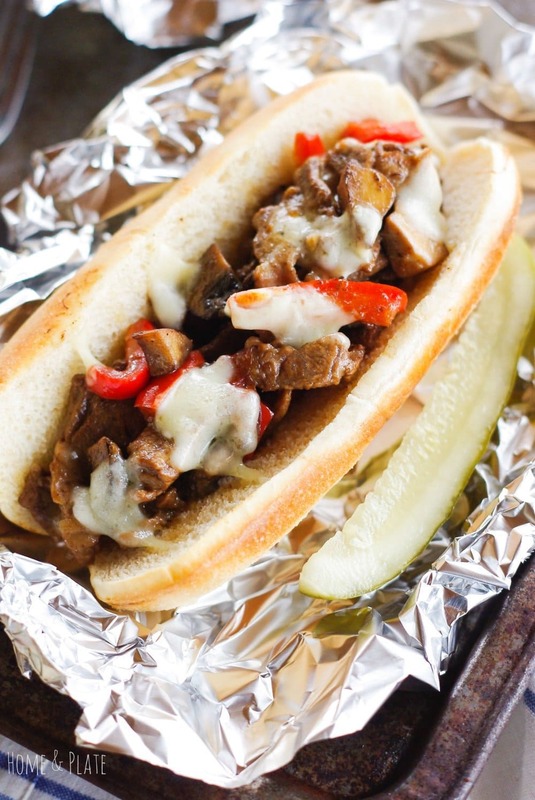 The end result is delicious seared strips of steak, sautéed onions, mushrooms and sweet peppers and plenty of cheese on a crusty steak roll. Serve it for game day, lunch or for an easy weeknight dinner. Sauté the vegetables in 1 tablespoon of olive oil over medium heat for about 5–6 minutes. Cook the vegetables until they have softened slightly. Transfer to a bowl.Chop the thin slices of New York strip steak into small bite-sized pieces. Cook the steak in the pan for 5–6 minutes. Add the Worchestershire sauce and soy sauce to the meat.Return the vegetables to the pan and mix with the meat. At this point, you can add the cheese to the mixture to combine with the steak and skip the mixture into the rolls or transfer the meat and veggies to steak rolls and placed three cheese slices on each sandwich. If adding the cheese on top, place each sandwich under a 500° broiler for a minute to melt the cheese. Be sure to watch to make sure the sandwiches don't burn. Remove once the cheese is melted and serve. My dad and my husband would both LOVE This! And the recipe looks easy enough that i could probably actually make it for them! haha. Yes Liz, these steak sandwiches or a breeze to whip up. They’re perfect for today’s Super Bowl game. Oh my goodness! Yes, please! My husband is going to love these. OMG I love Philly Cheesesteaks! I don’t have nearly enough of them. Superbowl is a great excuse to enjoy this for dinner! Thanks so much. 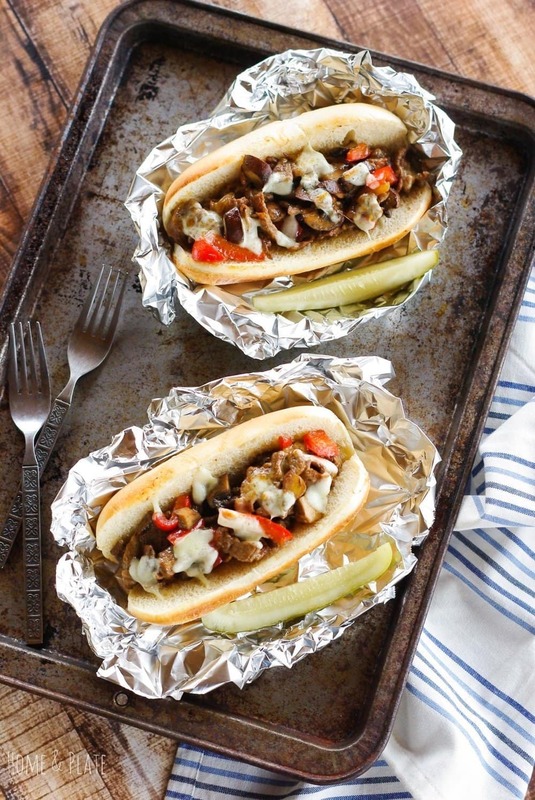 I agree that the Super Bowl is a great excuse to enjoy these Philly cheesesteaks. Holy YUM. These look SO good… my only problem will be sharing them with others! Definitely need to try them soon! Thanks Karly. They’re perfect for game day.